Shares of Adobe are racing back to all-time highs, with plenty of fundamental support for further price appreciation. In its most recent quarter, Adobe saw two points of revenue growth acceleration, which is incredible for a company of its size. Notable drivers included an increase in ARPU as well as momentum in Document Cloud (Adobe's competitor to DocuSign). Recently, Adobe has also bolstered its efforts in marketing software, joining forces with Microsoft in order to compete against Salesforce. Though Adobe seems like a perennially expensive stock, its capacity for double-digit earnings growth balances out its high valuation multiples. With stocks getting expensive again, many investors are asking the question: what's a safe growth stock to hold on to for the long term? Adobe (ADBE), in my view, is a perfect candidate. The software publisher best known for tools like Adobe Acrobat and Adobe Reader has consistently proven itself as one of the strongest earnings performers in the software sector, with the capacity to sustain mid-20s revenue growth while growing earnings at a much faster pace. With a market cap over $130 billion (during the December meltdown of the entire stock market, Adobe's market cap briefly sank under $100 billion - if only we had loaded up on more shares then! ), Adobe is one of the largest software companies in the industry, on par with Salesforce.com (CRM) and right behind the "legacy" giants Oracle (ORCL), SAP (SAP), and Microsoft (MSFT). Yet, among these large-caps, Adobe and Salesforce have also proven themselves to be among the fastest growers. Part of the reason is inorganic growth. Like Salesforce, Adobe has chased growth in recent years by acquiring smaller software publishers. It certainly hasn't been shy about M&A - it spent nearly $5 billion last year to acquire Marketo. Yet, much of its growth is organic too - the company has seen tremendous success at converting its customer base into a subscription model and driving cross-selling opportunities across its product suite to increase average revenue per user (ARPU). In my view, the Adobe rally still has plenty of steam. Investors would be wise to build a position in Adobe to benefit from its consistent trend of outperforming the broader markets. 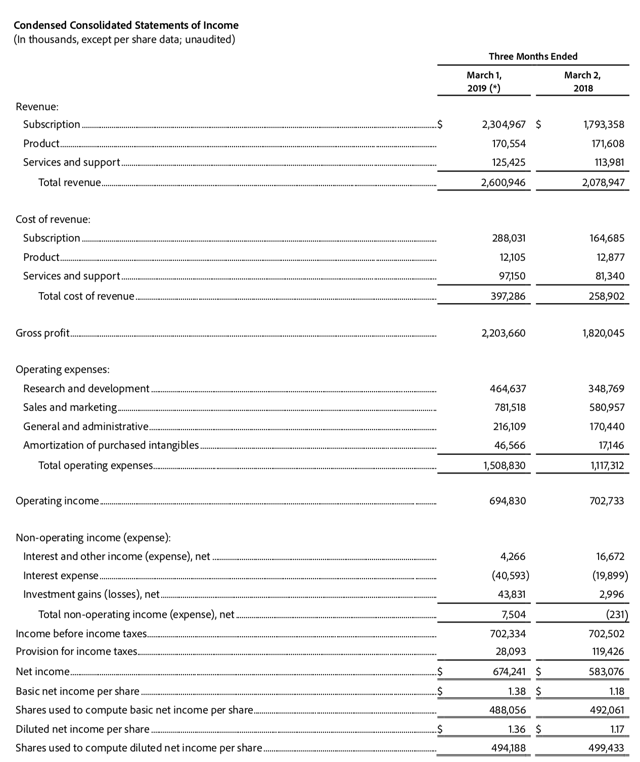 Adobe's revenue guidance remained flat at $11.15 billion (representing 23% y/y growth over FY18 revenue of $9.03 billion), though Adobe's history of conservatism suggests that growth may actually clock in one or two points higher. Consensus estimates pin Adobe's FY19 revenues at $11.17 billion (+24% y/y), and even that higher figure is likely to be adjusted upward if Adobe keeps beating its quarterly earnings. The company did, however, increase its EPS target to $7.80, up five cents from a prior view of $7.75. While this still implies that Adobe trades at a rather meaty 35x forward P/E ratio, I'd argue that the combination of double-digit revenue and EPS growth still makes Adobe an attractive play. Note as well that consensus pins Adobe's FY20 EPS at $9.67 (+24% y/y versus the company's FY19 guidance of $7.80), per Yahoo Finance. The stock's rich P/E multiple is a fair reflection of the fact that Adobe consistently manages to produce above-market EPS growth. The most encouraging data point, in my view, is the acceleration in revenue growth. Q1 revenues clocked in at $2.60 billion (+25.1% y/y), whereas Adobe had exited Q4 at just 22.8% y/y growth. This represents 230 bps of sequential acceleration. For a smaller software company or a recent IPO, this might be a more normal incident. For a large software company at a >$10 billion run rate, however, this is an incredible feat. It was also a record revenue quarter for Adobe, with many of its individual clouds also achieving all-time quarterly revenue records. It's true that the consolidation of Marketo and Magento's revenues (both recently acquired and fully baked into the results this quarter) helped revenue comps, but note that Wall Street's consensus estimate for the quarter was still much weaker at $2.55 billion, representing just 22.6% y/y growth - analysts had modeled in slight deceleration, while Adobe gave them the opposite. Recognize also that 91% of the company's revenue is from recurring sources. Unlike many other software companies that can close big one-time deals to drive a quarterly beat, the lion's share of Adobe's revenues is completely sustainable. Several growth drivers are worth pointing out. 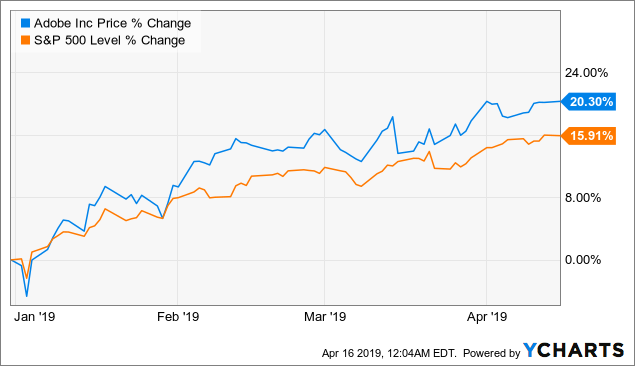 The company called out particular strength in Document Cloud, which is Adobe's answer to the growing popularity of DocuSign (NASDAQ:DOCU). The company added $65 million in new Document Cloud ARR in the quarter (for sizing purposes, DocuSign only generates about $200 million in revenues per quarter). Adobe also called out strong cross-sell results for enterprise customers between Acrobat and Document Cloud, as well as higher-than-expected conversion of free trial users to fully paid users. Adobe also noted that it drove a strong increase in ARPU across the board. 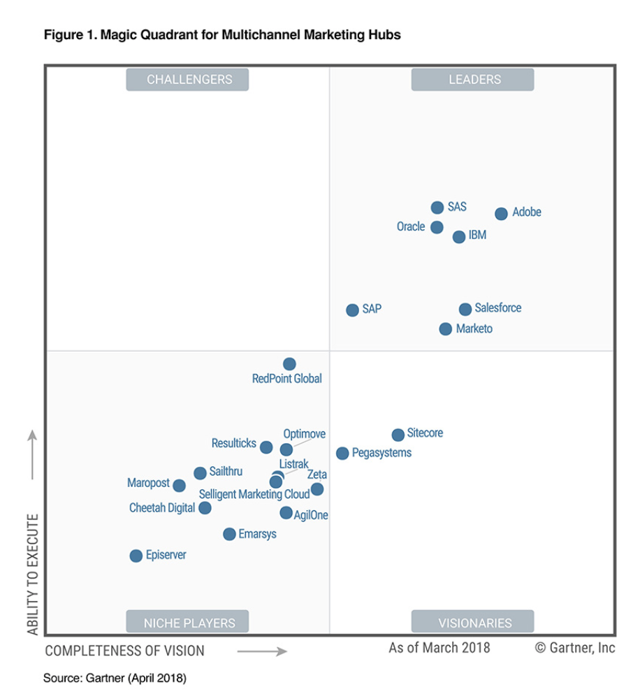 Cross-selling has become a major theme across the past few quarters - as Adobe's product portfolio has swelled beyond its core flagship products and into newer marketing/e-sign offerings, its customer base has also consumed more and more Adobe subscriptions. As we look ahead to further growth drivers for FY19 and beyond, one of the key points is the fact that Adobe is actively pushing to expand its TAM. As highlighted by its monster acquisition of Marketo in September last year, marketing software has been a major push for Adobe - and one outside its traditional realm of design/creative software intended for retail users and small teams. With the addition of Marketo, Adobe's push into enterprise-level software has become far more prominent. The Microsoft/LinkedIn partnership reflects a strong focus on marketing solutions as a focal point for growth in 2019, and will certainly bring a lot of greenfield revenue opportunities from the enterprise segment in the coming year. If you're looking for a growth stock to hold onto for several years, look no further than Adobe. Over the past year, the company has not only managed to convert nearly the entirety of its customer base into recurring subscriptions, but it has also expanded meaningfully into new software categories such as marketing and document management. Aside from completely dominating the Adobe Acrobat/Pro/Reader space that it's best known for, Adobe has also become a major competitor to the likes of DocuSign and Salesforce. Its ability to sustain ~20% y/y revenue growth alongside double-digit EPS and cash flow growth is a testament to the richness of its market opportunities. Stay long here and hold for the long term. Disclosure: I am/we are long ADBE. I wrote this article myself, and it expresses my own opinions. I am not receiving compensation for it (other than from Seeking Alpha). I have no business relationship with any company whose stock is mentioned in this article.